Continuing with the theme of all-white houses, here is another brilliantly designed Stockholm home. Be inspired by the infusion of color in simple art forms, cushions, throws and glass vases. This was not how the house when designer Victoria Hamberger moved in with her family. As per the article, the house was a riot of colors. In its present state, it is anything but that. It’s a century old villa – built in 1907 to be precise – that has housed two generation of a designer family before Victoria moved in with hers. 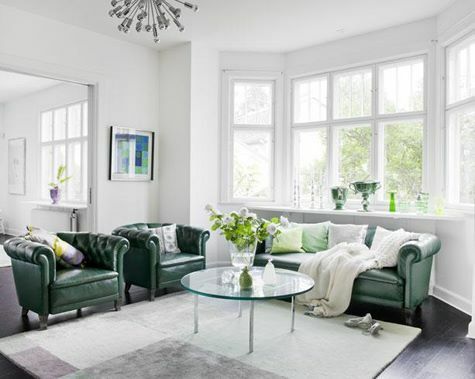 The green Chesterfield Sofa defines the theme for the living room. When you are not sure of what curtains to purchase, it’s often easy to go with the pre-dominant piece of furniture in the room. When you are walls are white, you are not restricted in choosing the color of furniture. The green vases on the window sill accentuates the color scheme in a subtle way. Do you see how much blue, purple and shades of lilac bring so much life to this dining room? I love this play of colors..here again, the dining chairs set the tone which is carried over to the rug in a mild manner. The curtain is in a brighter shade but the choice of fabric is excellent as it is sheer and lets sunlight stream in through the windows. Even the pots and cabinets are color coordinated. What is the most striking feature in this picture? The art work? More often than not, a simple art work can create magic. It need not be a expensive store bought one. Just buy a framed canvas from any stationery shop and create your own art with palm prints in different colors, or a mix and match of geometrical shapes. It’s cheap and easy to do, but when hung on a wall, it has the power to become the focal point. 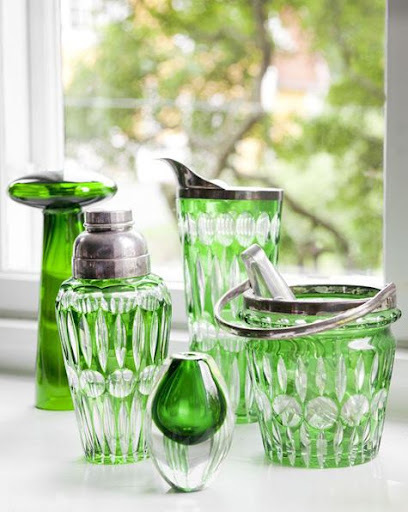 Totally in love with this green glassware. The antique pieces are supposedly a gift from Victoria’s parents. It’s undoubtedly for keeps for a lifetime. 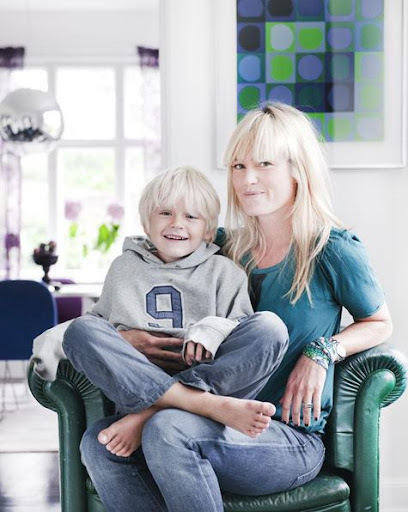 For more pictures of her sprawling home, go to Mixr. If you notice, there’s a central object in every room that determines the color scheme. In this predominantly white house, you have a rainbow of colors from fuchsia green and black to lavender and red. 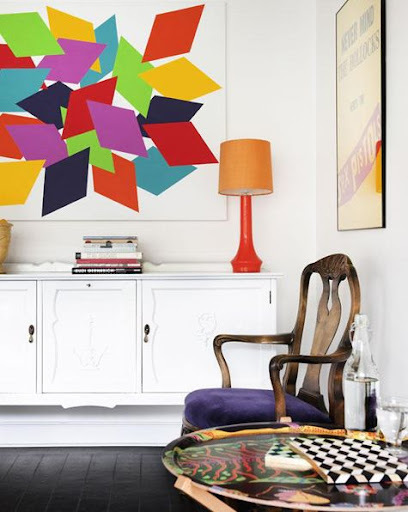 Here’s How This Designer Infuses Color in Her Home with Just One Thing. Take a Guess! oh lovely!! such a gorgeous home.. with bursts of happy colour!! wow! !